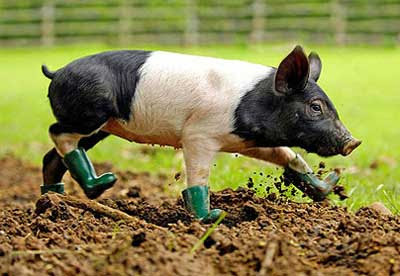 Meet Cinderella, a sweet little piggy whose fear of mud was conquered when her owners provided her with a set of wellies. Awwww. What's the meaning of all this cuteness? Well as regular readers know, it means that tomorrow's post is going to be EXCEPTIONALLY gruesome. That's right. I've been saving this one up for weeks. And now that the weather has turned cooler, it's time to unleash some serious scariness! what is this world coming to?!?!?!?!? And sorry I haven't I haven't been commenting much, I've been really really busy and half the time our internet is DEAD. And check this and this out! I am shocked. How did you find that Hazel?? That's soo cool! OoO The nail one reminds me of a story I heard one the news one day... But the scorpian thingy... I saw a friend from China eat it. It was crunchy! But she looked grossed out when she ate it... ^^' I've eaten cicadas before! XD And sparrows and fried worms in China. Oh yeah! and I've also eaten snake and turtle soup! (I think I said those stuff before...) Lol, China has the weirdest food! will the next post make me physicallt sick, or just sad, or just in fear for my life, or just queeeeasy? kitty: sparrows!? as in birds?! If you need something for after the gruesome post, here's an article about a cute little unicorn. There is a really funny story(which is true) where a chicken(so cute!) had taken up residence in a Californian McDonalds(outside it). She would sit in the Drive Thru lane, so no one could buy their McChicken! Ha. They caught her after four month of trying. The scientific name for eating bugs is Entomophagy. It's on my blog. Freaky.